Italy may hold repeat elections as early as July after the man asked to be prime minister failed to secure support from major political parties for even a stop-gap government, sources said on Tuesday, as markets tumbled on the growing political turmoil. Italy has searched for a new government since inconclusive elections in March, with the president finally designating former International Monetary Fund official Carlo Cottarelli as interim prime minister until a new vote is held between September and early 2019. But sources close to some of Italy's main parties said there was now a chance that President Sergio Mattarella could dissolve parliament in the coming days and send Italians back to the polls as early as July 29. That prospect emerged immediately after Cottarelli met the president on Tuesday afternoon and left without making any statement. 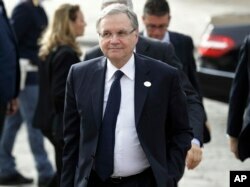 Cottarelli had been expected to announce his stopgap government's cabinet after those talks. A source close to the president said Cottarelli had made no mention in the meeting of an intention to give up his mandate and that he was simply finalizing his cabinet lineup. Major parties, though, sensed Cottarelli's mission was all but dead and called for parliament to be dissolved immediately. “It would be best to go to elections as quickly as possible, as early as July,” said Andrea Marcucci, senate leader for the centre-left Democratic Party. Italy suffered its biggest market selloff in years amid investor fears the election would deliver an even stronger mandate for anti-establishment, eurosceptic politicians, casting doubt on Italy's future in the euro zone. Bank of Italy Governor Ignazio Visco arrives for the opening session of the G7 of Finance ministers in Bari, southern Italy, May 12, 2017. Yields on Italy’s two-year bonds, the most sensitive to political upsets, suffered their biggest one-day jump since 1992. The euro also hit multi-month lows, as credit rating agency Moody’s signalled a possible downgrade for Italy if the next government failed to address its debt burden. Central bank Governor Ignazio Visco said Italy “must never forget that we are only ever a few short steps away from the very serious risk of losing the irreplaceable asset of trust,” but there were “no justifications” for the market turmoil. Euro zone money markets had been betting on the ECB raising interest rates from ultra-low levels mid-next year. But with economic growth slowing and worries about Italy, they are now pricing in just a 30 percent chance of a modest 10 basis point rise in June 2019. 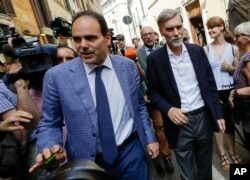 Democratic Party members Andrea Marcucci, left, group leader at the Italian Senate and Graziano Delrio group leader at the Lower Chamber walk in Rome, April 24, 2018. President Mattarella had looked to Cottarelli as prime minister to calm political and market turmoil, which Italy's two anti-establishment parties blame on the president himself after he vetoed their choice for economy minister in their would-be coalition government. Mattarella blocked Paolo Savona as unsuitable on the grounds he had argued Italy should be prepared to quit the euro. The 5-Star Movement and the far-right League, the biggest winners from the March election, declined to nominate an alternative candidate and abandoned plans to form a government, switching back into election mode, with 5-Star Movement calling for Mattarella to be impeached. Other euro zone countries are concerned about the currency bloc's third-largest economy. French President Emmanuel Macron defended what he called Mattarella’s courage and German Chancellor Angela Merkel spoke of the need to obey rules governing the euro. Even if Cottarelli were able to form an interim government acceptable to the splintered Italian parliament, investors believe he would fail to pass the 2019 budget, triggering a snap election in the autumn. The election campaign is likely to centre on Italy’s relationship with the European Union and in particular the budget restraints imposed on members of the euro zone. A poll by SWG showed support for the League had jumped to 27.5 percent, up about 10 points from the March 4 elections. With support for 5-Star falling about three points to 29.5 percent, the two combined would have a majority in parliament if they decided to join forces again.